As part of a blind tasting, I would rather have located all four bottles reviewed here in the blog (here, here and two of them here) to Scotland without hesitation. Admittedly, smoky whiskies are a rarity among continental barley malt distillates and this could possibly explain it, but it wasn’t just that. 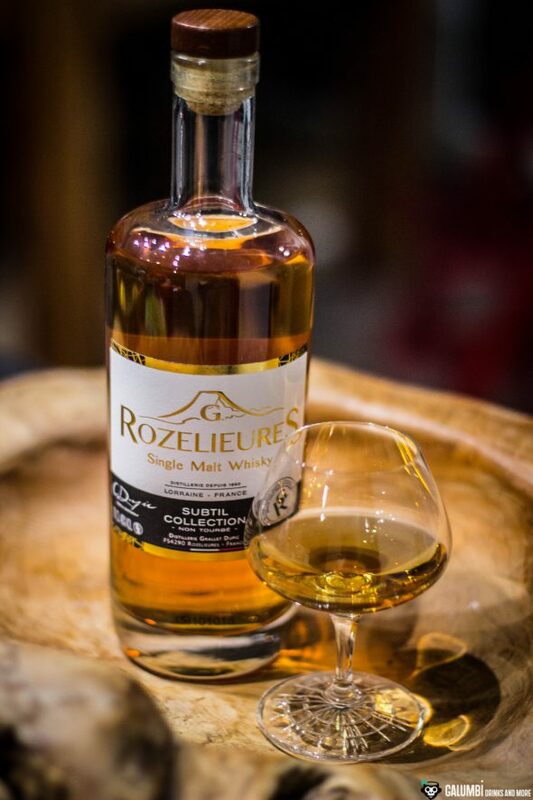 Rather, the G. Rozelieures whiskies showed a very beautiful, spicy and round basic character paired with a very exciting maturation in former sherry or cognac barrels. 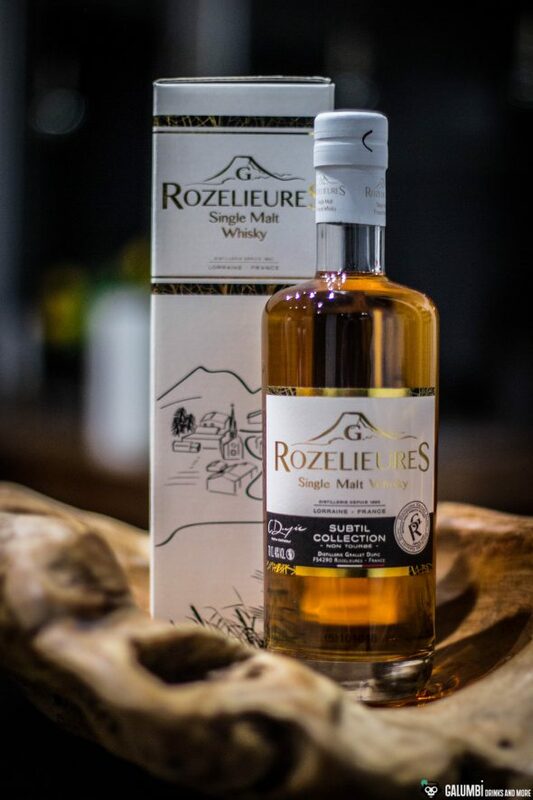 Now a new bottle was launched as part of the series, which stands out significantly from previous bottlings: it was not made from barley malt dried over smoke and is therefore the first non-smoky G. Rozelieures whisky. Since I have already reported about the background of the distillery, the people behind the brand and also about the name dispute (I would like to recommend this article to those interested), I would like to go directly to the heart of the matter today. The single malt whisky, which is named “G. 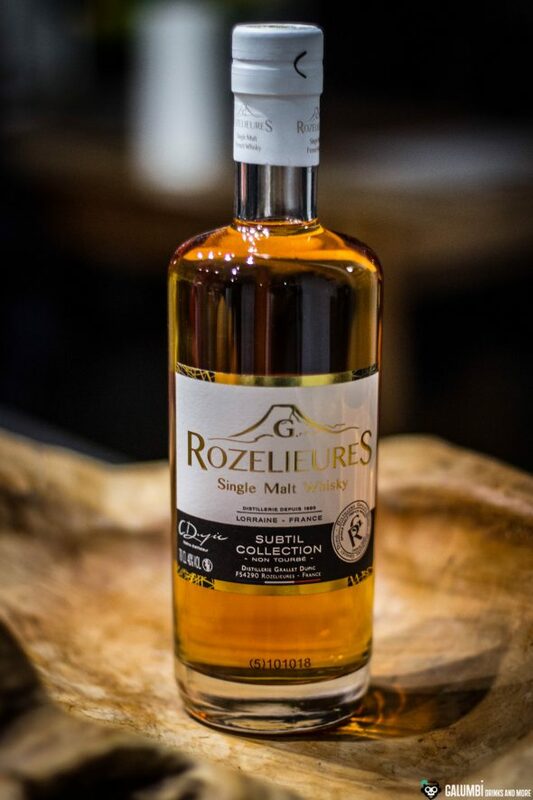 Rozelieures Subtil Collection”, was – like the other whiskies in the series – distilled twice and then allowed to mature in former cognac barrels, ex-Bourbon barrels and new barrels from the Vosges region. This bottle also does not bear an indication of age. It was bottled with an ABV of 40% and costs about 50 euros. Aroma: Malt, honey and cereals, but above all there’s a beautiful, fully ripe pear with hints of baked quince. Over time, a few notes of fermented, bright-colored fruits arise. Again, I like the first impression of this G. Rozelieures! Taste: This whisky – and that is actually somewhat unexpected considering the name “Subtil” – turns out quite spicy on the palate. The pear and quince are once again present, but the influence of the barrels with dry oak notes is surprisingly distinctive. I can find a bit of vanilla, honey and cinnamon, with nuances reminiscent of bread. Once again: as part of a blind tasting, I would classify this whisky to be from the Highlands. 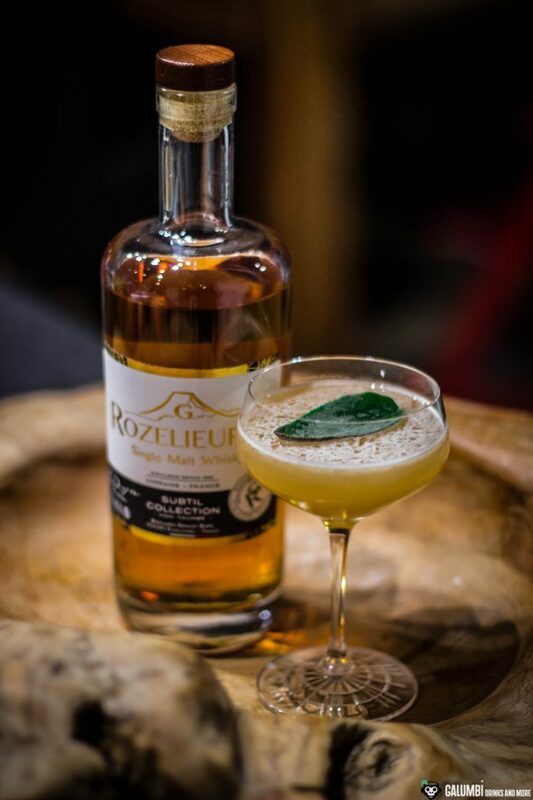 G. Rozelieures definitely does not have to hide with this bottle, even if the alcohol still reveals a little of the presumed youth of this distillate. Finish: quite dry with pear and a hint of green oak wood. 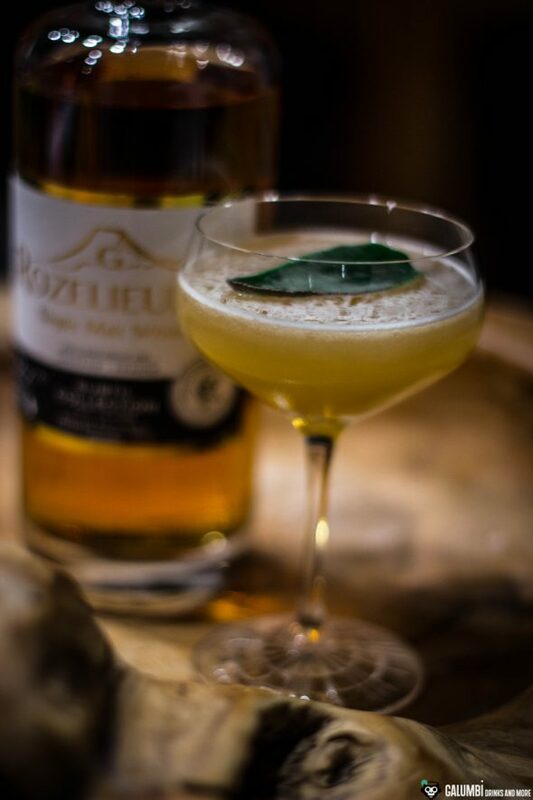 It soon became clear to me that I had to take on the pear characteristic of the G. Rozelieures Subtil in a cocktail. However, to simply reduce it to a “peary whisky” would be a wrong approach for this single malt because of course there is a lot more to it than that. 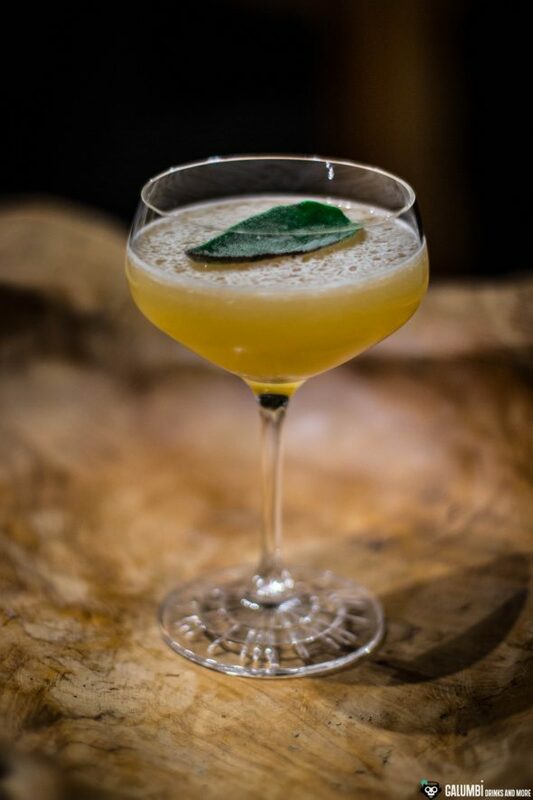 That’s why I was more interested in accentuating the pear notes and embedding them in an aromatic frame. 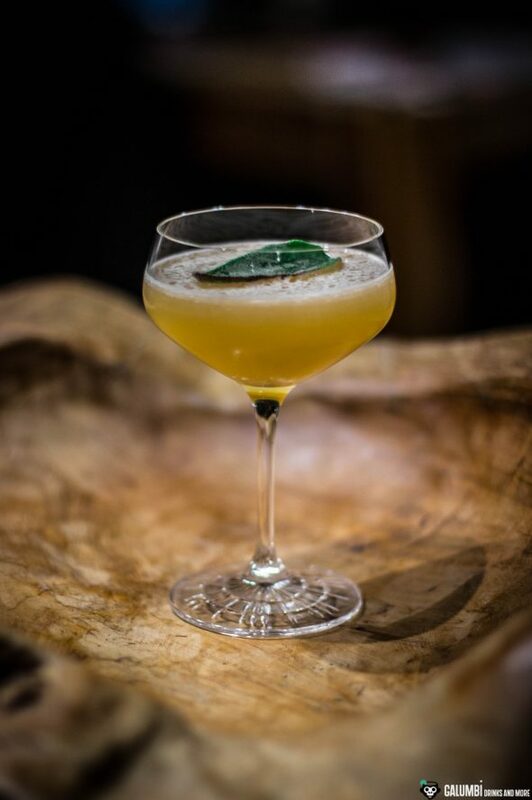 In a way, I wanted to create a more “mature” drink around the aroma of the pear. The very nice Moor-Birne from Scheibel sets the accents here, while very easy-to-make sage syrup, some lemon juice and the very beautiful Galgant cream liqueur from the Prussian Spirits Manufactory (Preußische Spirituosen Manufaktur) play the accompanying music. And since I had dealt with some sociological topics on the day the drink was made, the name was quickly found: Pear Group Member. 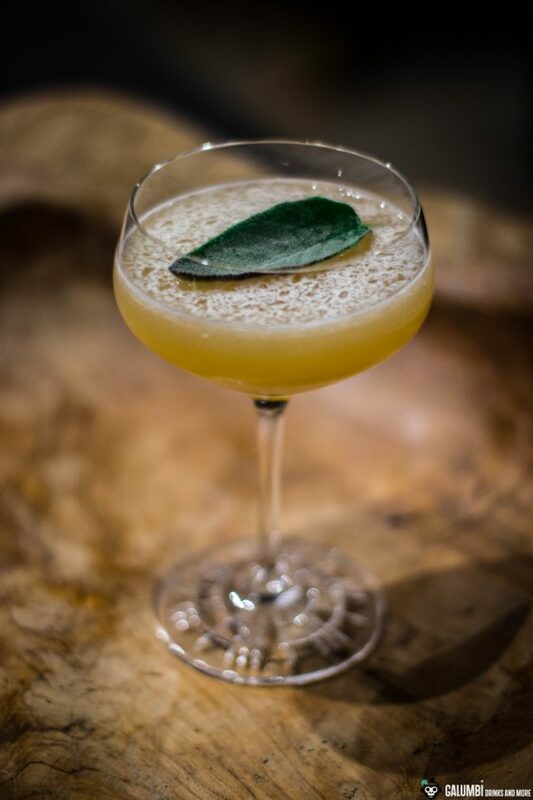 Sage syrup: Add a handful of fresh sage leaves to each 100 ml water and 100 g sugar in a pan and bring to the boil. Simmer until the sugar has dissolved and a syrupy consistency is achieved (between 5 and 10 minutes). The syrup should have a slightly greenish color. Preparation: Shake all ingredients vigorously on ice and strain into a pre-cooled glass.